A multiplier event is an event that is organised to share the intellectual outputs of a project – upon its completion- with a wider audience and target groups external to the Consortium. 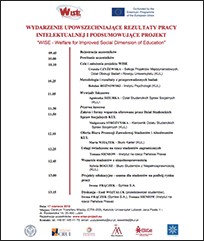 As to WISE – Welfare for Improved Social Dimension of Education, three multiplier events have been organised throughout the project: a final conference in Milan and two events at national, local level both in Lublin and Zagreb. A second multiplier event was held in June 17th, 2016 at the seat of Katolicki Uniwersytet Lubelski Jana Pawła II (KUL) in Lublin, Poland. The agenda of the meeting organized in the Knowledge Transfer Centre (KUL) included introductory information on WISE project, its main objectives, developed and approved research methodology, focus group reports and research analysis. During the meeting, the emphasis was laid on the advantages that the innovative WISE model will bring to all interested parties. 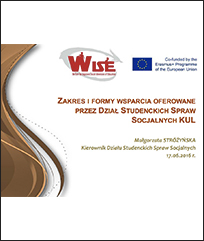 The conference has illustrated the students support services provided at KUL in the light of WISE project’s results. There were present 30 representatives of all three sectors: public (e.g. Lublin City Office, The Lubelskie Province Governor’s Office in Lublin), private (e.g. Syntea S.A) and non-profit (e.g. The Rule of Law Institute Foundation). Their presence has a strategic importance for the creation of multiplication effects. The moderated discussion on the general condition of student welfare in Poland and Europe from perspectives of gathered participants has ended the meeting. 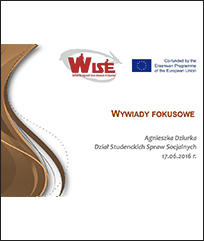 The conference illustrated the project, all the major steps carried out and main results but also the advantages that the innovative WISE model will bring to all interested parties. Their participation is given a strategic importance for the creation of multiplication effects.